Promo Blitz for ‘Life’s a Beach and then.. But Philippe has not been completely honest either and when Holly stumbles across the truth, she feels totally betrayed. Julia Roberts was born in Nottingham in 1956 and shortly afterwards, in 1957, contracted the deadly disease Poliomyelitis, more commonly known as Polio. After a five month stay quarantined in hospital she was discharged on Christmas Eve with her left leg in a calliper. Thanks to extensive physiotherapy, swimming lessons, and persistent parents, who wanted their daughter to be able to walk through her life unaided, Julia was out of her calliper by the age of 3. It was at primary school that Julia’s creative and performance abilities began to shine through. Having started ballet classes at the age of three, again to help with strengthening her left leg, she was unable to attend for two years due to the death of her grandma and her mother’s ill health. Julia recommenced dancing lessons across multiple styles at the age of 9, and also began elocution lessons. She was very successful in the Nottingham Speech and Drama festivals and also in a variety of dancing competitions. At the age of ten she wrote her first play which was performed by fellow classmates at Jesse Gray School, and buoyed by that success she entered a short story writing competition, with her creation The Foundling, and was awarded second place. Despite the challenges of a weak leg, Julia had decided that she wanted to become a professional dancer. Summer Seasons, pantomimes, a Caribbean cruise, and a stint at a theatre in Barcelona followed before Julia hung up her dancing shoes and moved into television. Initially she hit the screen as a TV extra before gaining small acting roles in TV shows such as Citizen Smith and many television commercials. In addition to her on screen parts, Julia also secured a recording contract in the early 1980s with a band called Jools and The Fools. As the 1980s fitness boom gripped the nation, Julia began teaching fitness classes to supplement her income before becoming one of the original hostesses on the game show The Price is Right in 1983. After 2 series of the show, Julia had a production of her own…her son, Daniel. He was followed 13 months later by her daughter, Sophie, which led her to take a short career break. During this time, Julia decided to try her hand at television presenting, landing herself the role of chat show host for her local channel in Croydon. One of the shows she presented weekly was entitled Palace Chatback and this led her to become an avid Crystal Palace supporter. She also produced and presented features about her team for Sky Sports. In 1993, she auditioned to become a presenter for a shopping channel called QVC and, having been offered the job, was one of the first faces to launch the channel on 1st October the same year. 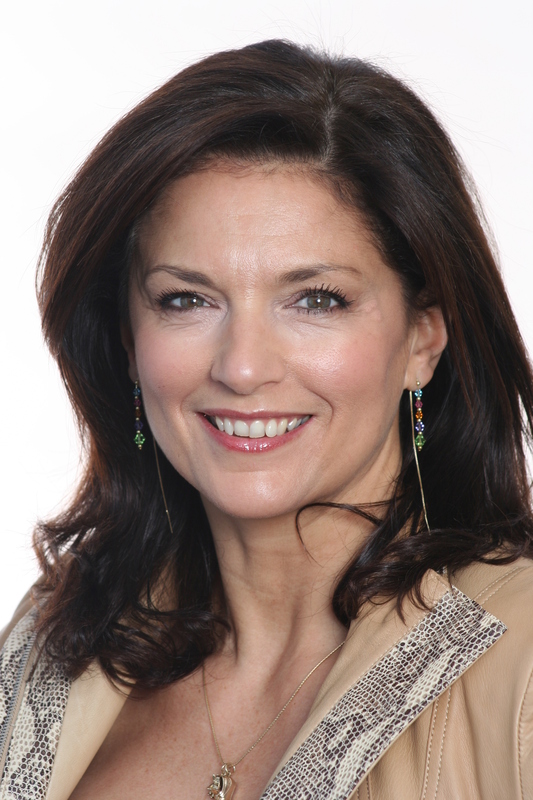 Julia has worked there ever since whilst continuing presenting roles for Sky Sports and several corporate productions. Throughout her career, Julia has always wanted to write a book but, as a working mum, was time-starved. She kept her hand in writing for magazines and newspapers, and eventually started her first book – a memoir entitled One Hundred Lengths of the Pool – in 2011. The concept was a little different from a standard memoir, with Julia using the numbers of each of the chapters to relate to moments from her life. Having battled against Polio as a young child, Julia had a new health challenge to face as, in April 2012, she was diagnosed with Chronic Myeloid Leukaemia. CML as it more commonly known is a rare type of blood cancer which affects only 600 people per year in the UK. Julia responded well to the early stages of her treatment but in November 2012, her BCR/ABL results showed an increase in the levels of the disease. It was a frightening time for Julia as she feared she may have developed a mutation of CML called T3151 which is resistant to any currently available drug therapy. Fortunately, an increased dosage of her treatment drug, Imatinib, brought these elevated levels of the disease down and they have continued to reduce. It was in April 2015 that Julia received the news that there is now no recordable level of the disease in her body, although she has to remain on medication for at least two more years. Throughout her battle with CML she has continued working full-time at QVC, attempting to keep normality in her life. She signed a publishing deal with Preface Publishing for her book One Hundred Lengths of the Pool and that was a sell-out success on QVC. As a result of the publicity surrounding her book she was approached by the British Polio Fellowship and asked to become an ambassador for the charity which she readily agreed to. In conjunction with QVC, British Polio and Leukaemia and Lymphoma Research, Julia organised a charity swimming gala where she set herself the challenge of swimming one hundred lengths of the pool while other participants took part in fun races and games. A percentage of the profits from her first book went to polio charities and a similar percentage of her latest book will go to Leukaemia and Lymphoma Research. Following the launch of her first book, Julia needed a well-deserved break and booked a holiday to Mauritius. Her children, now adults, had bought her a notebook with words on the cover that read Hold on people… I’m having an Idea. On the first morning of her holiday, Julia had just that – the idea for her first novel. Over the course of the ten days she was in Mauritius, she scribbled copious notes, thoughts and ideas. When she arrived home, she started writing.